Any coach can make you tired, but not every coach can get you faster. If you are looking for quality speed instructors who provide a specialized speed program geared for your athlete, LET’S TALK. 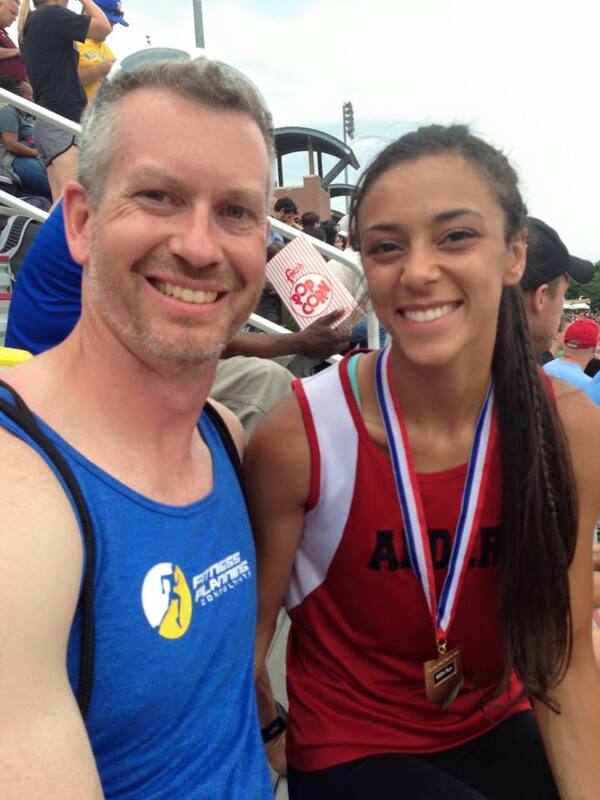 Adam with one of FPC’s athletes, Aziza Ayoub from Jonathan Alder, who won the Division 2 800M run this past spring. Many athletes in Columbus, Ohio are coming to us for speed training because they feel if they could get faster, it would make them that much more of a better athlete and improve their confidence. At our Dublin based speed training facility, not only are local athletes from Columbus, Dublin, Upper Arlington, Worthington, Hilliard, Westerville, and Lewis Center attending our speed sessions, but we continue to draw athletes from such distances as Reynoldsburg, Gahanna, New Albany, Bexley, Pickerington, Pataskala, Marysville, and Canal Winchester. Click here to read about some of the successful Columbus area athletes we have gotten faster for their sport. Many parents are coming to us saying, “Our child is a good athlete, but he/she is just so slow.” The running form isn’t where it needs to be and that initial burst isn’t there like it is with some kids. The fear is that if the speed is not improved it will come to hurt the athlete as he/she gets older when teams actually have tryouts and then cuts. You as a parent know what’s needed to be done and some of you actually have the knowledge to help your child. But, as a parent I know this only to well, your child does not listen to you at all when it comes to your suggestions about how speed can be improved. What the heck does mom and dad know? I’ve had parents of clients who were collegiate athletes at the highest level send their kids to me because the kid just wouldn’t listen. Then, there is also the myth that your speed cannot be developed. If you are fast it is all-natural and if you are slow, well you better get used to it. Wouldn’t you like to see your athlete get just a little faster and just a little more light on the feet? You’re not asking for lightning quickness, but just enough where every so often he/she was the one blowing by the defender, getting to the loose ball first, or legging out the infield hit. Wouldn’t you want just enough quickness and speed to just see your athlete look a little more confident when playing? We hired Adam for a two week boot camp at the beginning of this pre-season. I think it helped immensely and we will be doing it again next year. This was the most prepared our girls have been at the beginning of practice in October. Adam Kessler was very professional and challenged our girls to reach their optimum level. Speed kills and I am a firm believer that what you do in the weight room translates to speed on the football field. We had a strength program in place, but when Adam took over, he fine tuned it and made it workable and efficient. Our workouts were shorter, but we were still getting stronger and faster. Our state championship football team was built for speed. Yeah, we had fast guys naturally, but it was the speed developed from the other guys that surprised the coaches and myself. I would definitely recommend this Speed and Strength training program to anyone who needs to get their team to that next level. Sports Conditioning Specialists have helped a number of our athletes make incredible progress as soccer players at the highest levels of high school soccer. Thanks to SCS we’ve seen very good players become all-district, All-Ohio and even NSCAA All-American! Adam and his staff do an incredibly thorough, dedicated and dynamic job with the athletes they help develop. Scott Dempsey, Head girls soccer coach at Bishop Watterson High School. Previously coached at Bishop Hartley and Bexley High School where he won a state title. Who Am I And Why Should You Trust Me To Get Your Athlete Faster? This is a fair question and you can read a lot of my story by reading the about us page. Let me just add by saying, it takes a little more than watching a few speed videos to get individuals faster. You also can’t rest on past athletic achievements to be able to coach an athlete how to get faster. It takes years of experience and application to get a system down that is successful and I feel that I have created the speed program that does that. I also like to create a family type atmosphere. Everyone that trains with Fitness Planning Consultants, should feel a special bond where everybody is encouraging everybody to succeed. Our more experienced athletes are helping the less experienced athletes. I want to create a lot of positive vibes that will transfer over when the athletes go back to playing for their teams. And yes, I want to get them faster and they usually do get faster. Why Should I Send My Athlete To Speed Train At Your Facility And Not Somewhere Else? Any coach can make you tired. Not every coach can teach you how to be faster. (obviously I like this quote) WE CAN!! Speed training boils down to two things: improving running mechanics and improving leg power. But, how each person goes about doing that is based on physical maturity, what their issues are that we need to correct, and how fast they are able to process the changes so we can progress them through the program at a pace suited for them. I and my staff really pride ourselves on working on the running mechanics of the individual so that his/her running form is as close to perfect as we can get. Then, and only then, can we put the athlete through the proper drills necessary to improve speed. If mechanics are ignored, all we are doing is reinforcing bad habits that might get them a little faster, but not as fast as they could get with proper mechanics. No other speed program in Columbus, Ohio can get your athlete to look better when they run, run faster (straight ahead and laterally), and feel much more confident when they play their sports. If you want a taste of what some of our program would be like, fill out the form to the right and get a FREE speed workout. Implementing those bodyweight exercises alone will strengthen your legs to get you faster. For our speed and strength programs, we can adjust the length of the program and the frequency to fit your needs. If you only have a limited amount of time or have a whole off-season, the program will be created specifically for you. We offer a shorter term quick hitter program or a longer term athlete development program and we encourage athletes to come in 2-3 times a week. Once we have evaluated you, we will be able to explain to you the different programs that we have to get you stronger and faster. This includes, but not limited to: one-on-one training, semi-private training, and individual programs you can do on your own. Our Assessment is provided with a 100% Money Back Guarantee, in case you didn’t feel that this Assessment was valuable to you. Please Note: You will be evaluated and tested at the initial Assessment, but you will only be re-assessed every third month you train with us. Anything less will not provide enough training to see a significant progress. We certainly allow athletes to train with us for any length of time. If you need a quick tune up between seasons, have only a short time frame, etc., but re-assessments will only be done every third month of training. Contact us now to set up an appointment for an Assessment today! Either through our contact page or (614) 460-5348. Not ready for an assessment, then sign up for a FREE consultation to meet us, see our place, and find out specifically how our services can help you out.